A model of a pre World War One German battle-cruiser the Blücher features in the really brilliant miniature ship work of Derek Meddings. My guess is the miniature work was shot in Malta where a part of the live action was shot. It could have been shot in the tank facility but I think its more likely the Mediterranean Sea, it's a bit hard to tell, but it is definitely a real horizon and sky. 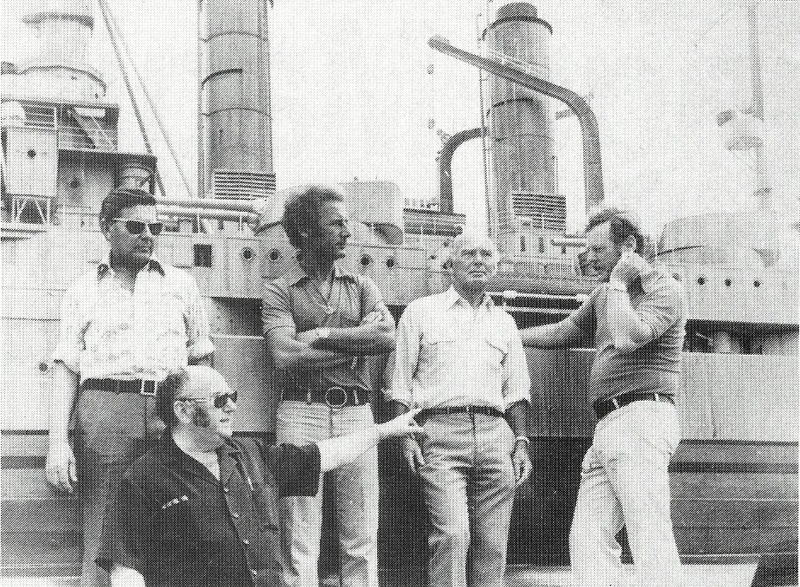 I can find no information of any kind about the model ship effects in this movie save for this one photograph with Derek Meddings and others standing in front of the miniature. It shows that the model was pretty large and in the film it is very impressively photographed giving a really good sense of weight and scale. It is only when the bow is coming right up into the lens when it rams the heroes' boat that some tell-tale miniature depth of field issues arise. Two legendary British effects supervisors Ian Wingrove and in Brian Smithies have contributed some details of the miniature work for this film in the comments section. I thought the information is worth putting up front here. Sid Cain-Production Designer Michael Klinger-Producer Derek Leon Davis-Construction Manager Bob Laing-Art Director. You are right it is (filmed) in open water off St Thomas Bay in Malta. Peter Biggs was the driver the rest of the SFX crew were John Evans, Brian Smithies & myself Ian Wingrove. The British flag ship was a glass shot photographed in St Pauls Bay ,along with another glass shot of the passenger boat that brought the hero to Zanzibar. Derek Meddings (third from left) in front of the Blücher model. The ship in background is painted on glass. Glass shot of the British Flagship. Thanks for the details Ian. I am a huge fan of your work, in particular in relation to the subject matter of this website, the movie "The People That Time Forgot" (which I am planning to post an entry on soon) which has some really terrific miniature ship and aircraft effects work. I might also add that I also built a biplane to do the crash scene with, but it was done with the full size one in south Africa for real -- fortunately the cameras were turning when it happened, sot he model was never used. Brian that's the sort of detail that is priceless. By the way I have been a huge fan of your work over the years, thanks for contributing. Very interesting. When I first saw this film I was impressed by the scenes with the Blucher, in fact I joked with a classmate that they must have raised one of the Kaiser's warships from Scapa Flow and restored it specially for the film. It's one of my favourite Roger Moore films outside of the Bond franchise and it's a cracking good adventure. Lee Marvin shows there was a lot more to him than Ben Rumson. I never have liked though the scene where Fleischer and the Schutztruppe storm the farmstead and Sebastian and Rosa's wee one is killed. For LITTLE SHOPPE OF HORRORS magazine, I am spearheading a 100-page issue devoted entirely to the making of FRANKENSTEIN: THE TRUE STORY (Universal / NBC-TV, 1973) and would love to interview you about the work you did on that film -- and whatever you can recall about the inner workings of the effects department. I have interviewed Leonard Whiting, Jane Seymour, David McCallum, Nicola Pagett, co-writer Don Bachardy, associate producer Ian Lewis, first assistant director John Stoneman, Universal president Sid Sheinberg, etc. Please contact me via email at sirvinprod@aol.com Thank you very much indeed! My favorite Frankestein film of all is Frankenstein: The True Story. Can't wait for that issue. That's the best miniature shot of an Ironclad Warship that I have ever seen. In some shots you can't see the difference between reality and miniature fake. Wonderful work. Nevertheless I totally hate modern ironclad steam warships because in my opinion they are very ugly designed and dirty looking vessels compared with wooden Ships of the Line and Galeons from the Age of Sail Era. Fortunately Germany never had a Sailing Ships of the Line Battlefleet as well as Great Britain, France,Spain, or all the other States as well as Russia, Sweden and Denmark, so I don't feel humiliated or uncomfortable about the German naval defeats during World War I. or World War II. because I'm not interested in modern Times and their ugly looking High Tech-Warships or Submarines. I am researching the full size aircraft that were constructed for the film. Two replica FE 5 Gunbuses were produced and as you say one was destroyed during filming, but what happened to the other? The model you constructed was from plans? Did you have a complete set or just a 3 view? Do you still have them?